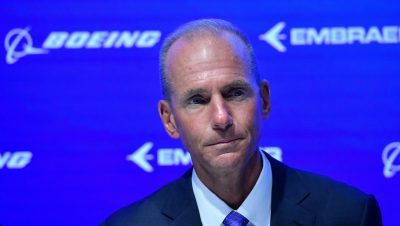 In a conference call with Wall Street firms in April of 2017, Boeing CEO Dennis Muilenburg lauded the Federal Aviation Administration’s “streamlined” certification process for enabling the aircraft manufacturer to rush its new 737 Max model into service. Four months later, the first 737 Max 8 commercial jet was brought into service. Since then it has become the giant aircraft makers’ best-selling plane, accounting for 30 percent of its profits, which grew 24 percent in 2018 to $10.5 billion. It is this aircraft that crashed in Indonesia in October of 2018 and on March 10 of this year in Ethiopia, killing all passengers and crew on board, a combined total of 346 people. In both cases, investigators have identified an automated system designed to counter the plane’s tendency to stall, called the Maneuvering Characteristics Augmentation System (MCAS), as a key factor in the fatal crashes. Muilenberg’s touting of the gutting of serious government oversight points to the systemic subordination of safety concerns to profit and market share and the transformation of regulatory agencies into rubber stamps for the major corporations. CNN reported Muilenburg’s remarks on Thursday, the same day that the Ethiopian Transport Ministry released the results of its preliminary investigation into the crash of Ethiopian Airlines Flight 302 just six minutes after takeoff from the airport in Addis Ababa. As in the Lion Air disaster just five months before, which crashed just 13 minutes after takeoff, the plane repeatedly pitched downward and the pilots were unable to regain control. The Ethiopian report, based on information from the recovered flight data recorder and cockpit voice recorder, as well as communications between the pilots and air traffic controllers, contradicted attempts by Boeing and some media commentators to imply that pilot error, not design flaws or faulty equipment and software, was responsible for the disaster. It concluded that just a minute into the flight, one of two angle of attack sensors on the plane began emitting false readings, triggering the MCAS anti-stall mechanism and forcing down the nose of the aircraft. Particularly damning for Boeing and the FAA was its finding that the pilots followed the emergency procedures provided by Boeing to counter such a development and manually stabilize the aircraft, but were unable to regain control of the plane. This shattered the claims made by both Boeing and the FAA after the Ethiopian crash that the steps provided to pilots to overcome such an emergency and manually fly the plane were simple and easy to carry out, and their suggestions that the Flight 302 pilots had failed to follow the prescribed emergency procedures. The preliminary report issued by the Transport Ministry’s Accident Investigation Bureau explained that the pilots disengaged MCAS, but the plane continued repeatedly to pitch downward despite their efforts to manually raise the nose. It further concluded that the manual control in the cockpit designed to lift or lower the nose, called the manual trim, failed to work. After the autopilot disengaged, the DFDR (digital flight data recorder) recorded an automatic aircraft nose down trim command four times without pilot’s input. It was at this point, some four minutes into the flight, and only then that the pilots reengaged MCAS, presumably in a desperate, last ditch attempt to save the plane. In the event, MCAS forced the nose down at a 40 degree angle, leading the plane to plunge to earth at an impact speed of 575 miles per hour. The report’s Safety Recommendations unambiguously place the onus for the disaster on Boeing and US regulators and imply that a far more serious and thorough examination is needed than the software patch on which Boeing is working before there is any return to service by the 737 Max. Since repetitive un-commanded aircraft nose down conditions are noticed in this preliminary investigation, it is recommended that the aircraft flight control system related to flight controllability shall be reviewed by the manufacturer. Aviation authorities shall verify that the review of the aircraft flight control system related to flight controllability has been adequately addressed by the manufacturer before the release of the aircraft to operations. Muilenburg, in a statement Thursday following the release of the Ethiopian report, acknowledged for the first time that faulty sensor data and MCAS played a role in the crash of Flight 302. However, the company and the FAA are planning only to add a software patch to MCAS that will prevent the system from being triggered by only one, instead of both sensors, and moderate the aggressiveness of its downward push of the nose. However, virtually nothing is being said about the highly unusual design that allowed MCAS to be triggered by only one sensor in the first place. The standard design for systems that are critical to the safety of a commercial aircraft has always included some form of redundancy, so that the malfunction of a single sensor does not lead to disaster. Why the 737 Max was designed without such redundancy for the critical MCAS function, and why no change was made after the Indonesian crash last October, has not been explained.